The Quirky Crossover iPhone case has two silicone straps that cross over in the back of the phone. The silicone straps, 12mm diagonal length, intersect to protect the back and bumper areas. 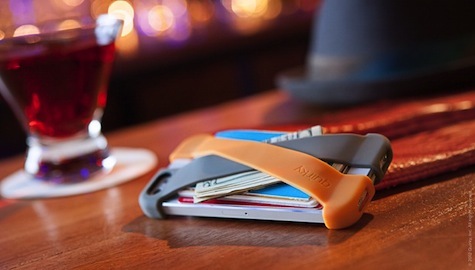 As a rabid fan of wallet cases, I was delighted to review the Quirky Crossover iPhone 5 case. The case protects the iPhone and allows a few credit or business cards to be stored under the intersecting straps. Quirky offers 12 colors, allowing the buyer to select the color combination for the two straps. The gray and orange straps of my review case were a lovely choice. The top strap has a hole for the camera lens. The bottom strap has a hole for the power button at the top and earbud at the bottom. The case’s minimalist design adds some bulk but very little extra weight, creating an experience that is similar to a naked iPhone. The accessibility of the power button may be an issue for buyers with large fingers. The phone can be charged while in the case. I was able to connect my Crossover protected iPhone to my car’s phone adapter cradle. The case functions as a bumper which provides very little protection for the iPhone screen. If this is a concern, a protected screen shield may be required. The $34.95 price is on the high side for a silicone case. The simple design and the ability to protect the phone while charging and functioning as a wallet may justify the price.